I’m a big fan of coconut flour. At first of all, it is not expensive, has a great flavor, it is gluten-free and it is perfect for low-carb desserts and snacks. 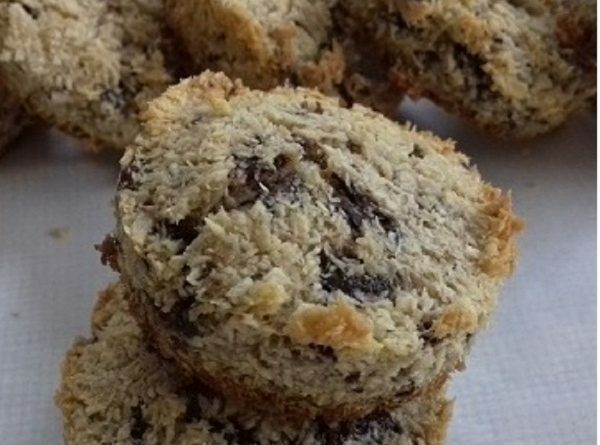 Coconut flakes mixed with chocolate chips, give you a perfect, instant, and healthy dessert. These keto chocolate chips cookies with coconut flour have a soft texture, a little bit crunchy outside. They are gluten-free, low-carb, low-calorie, grain-free and it can be and dairy-free ( instead of butter you can use a coconut oil). Mix until you get a solid, uniform mixture. Bake for 12-14 minutes, or until the cookies start to get gold color.